CHARLOTTE, NC (02/03/16) — Hundreds of veteran and military family entrepreneurs will converge on the City of Charlotte during Super Bowl weekend to engage in business education, training and networking to further hone their entrepreneurial skills and business goals at the 2016 Entrepreneurship Bootcamp for Veterans with Disabilities (EBV) National Training & Alumni Conference, to be held February 5-7, in Charlotte, North Carolina. EBV and EBV-F has impacted more than 1,200 veterans and military family members, with 68% of EBV graduates having started their own businesses. More than $196 million in revenue has been generated by EBV graduate businesses, and 92% of those businesses are still in operation today! The Entrepreneurship Bootcamp for Veterans with Disabilities (EBV) program is a one-of-a-kind initiative that leverages the skills, resources and infrastructure of higher education to offer cutting-edge, experiential training in entrepreneurship and small business management to post-9/11 veterans with service-related disabilities. Founded at Syracuse University in 2007, the program has since expanded to nine additional universities across the U.S., including Texas A&M, Purdue University, UCLA, the University of Connecticut, Louisiana State University, Florida State University, Cornell University, Saint Joseph’s University, and the University of Missouri –with Syracuse University serving as national host. Assistance from the U.S. Small Business Administration (SBA), corporate partners and donors allows post-9/11 veterans and transitioning service members with service-connected disabilities to attend the EBV programs cost-free. These ten world-class institutions together form the EBV Consortium, which serves as a national educational initiative designed to help veterans with disabilities to make the transition to self-employment, develop professional networks and ultimately start and grow sustainable businesses. The EBV Consortium represents the first major partnership of America’s universities and colleges of business since the end of World War II, formed with the express purpose of serving military veterans and their families. 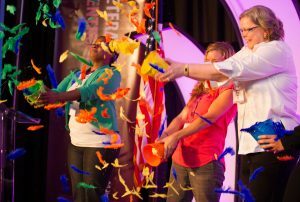 The EBV National Training & Alumni Conference in Charlotte, NC, will also be the site of the 2016 D’Aniello Family Foundation Business Plan Competition, where ten veteran entrepreneurs will compete for the chance to receive a share of more than $110,000 in available seed funding – thanks to the generosity of the D’Aniello Family Foundation and Disabled American Veteran’s (DAV). The ten semifinalists selected will present their small business plans to a panel of independent experts with deep track records in entrepreneurship. Read more at IVMF. Who’s coming to EBV in Charlotte? Nicole, a military spouse, and her husband, John Mahshie, who was honorably discharged from the Air Force in 2004, are no strangers to small business and entrepreneurship training. They are founders of Veterans Healing Farm, in Hendersonville, NC, which they started in 2013, and are prior students of IVMF’s entrepreneurship and small business training programs. Nicole and John are both graduates of IVMF’s EBV programming, with John graduating from EBV at Florida State University in 2013, and Nicole graduating from the EBV-Families program at Syracuse University in 2014. They both attended the EBV National Convention in Atlanta in 2015, where they pitched their business plan and won Best Overall Venture and Best Venture Supporting Veterans … and $35,000 to put towards their business! “Those winnings allowed us to grow by leaps and bounds in 2015 … and, in 2016, we are hiring our first staff members (an Army veteran and a Coast Guard veteran),” says Nicole, who looks forward to attending (with John) the 2016 EBV National Training and Alumni Conference in Charlotte. Meet two EBV graduates: Lisa Belcastro, owner of TF SASA, LLC / In Her Boots (Dallas, TX) and Charles Saatjian, owner of Jewelry Studio Inc. (Bozeman, MO) who, after meeting at a recent EBV Program event, formed an exclusive agreement/partnership for Jewelry Studio Inc. to design and produce jewelry for the ‘In Her Boots program’ – a sexual assault prevention program for the military. Belcastro says, “Not only are we veterans; we are EBV graduates, both operating under the same standard for business operations as set forth in EBV. Using the same skill set, we are speaking the same language. It’s just like when you are wearing the uniform; you automatically connect because the uniform represents the same foundation. The EBV program gives veteran entrepreneurs that foundation.” Both Belcastro and Saatjian will be present at the Feb. 5-7 EBV National Training & Alumni Conference. The Entrepreneurship Bootcamp for Veterans with Disabilities (EBV) is a novel, one-of-a-kind initiative designed to leverage the skills, resources and infrastructure of higher education to offer cutting-edge, experiential training in entrepreneurship and small business management to post-9/11 veterans with service-connected disabilities and a passion for entrepreneurship. Administered by the Institute for Veterans and Military Families (IVMF) at Syracuse University in partnership with the U.S. Small Business Administration, the EBV program seeks to open the door to economic opportunity for our veterans by developing their competencies in creating and sustaining an entrepreneurial venture. Widely acclaimed as the nation’s premier veteran entrepreneurship training program, EBV has been recognized as a national best practice by the Department of the Army and one of the 10 best entrepreneurship programs in the United States according to the editors of Inc. Magazine. EBV was featured on CBS News’ 60 Minutes in 2012; watch feature “Succeeding as Civilians” at CBS News’ 60 Minutes. The Entrepreneurship Bootcamp for Veterans’ Families (EBV-F) is an education and training program founded in 2010 at the Whitman School of Management at Syracuse University (SU), which expanded to Florida State University (FSU) in 2012. The program leverages the flexibility inherent in small business ownership to provide a vocational and economic path forward for military family members or for the surviving spouse of a military member who gave his or her life in service to our country. The EBV-F is operated by SU’s Institute for Veterans and Military Families. Since its founding on July 30, 1953, the U.S. Small Business Administration has delivered millions of loans, loan guarantees, contracts, counseling sessions and other forms of assistance to small businesses. SBA provides assistance primarily through its four programmatic functions: Access to Capital (Business Financing); Entrepreneurial Development (Education, Information, and Technical Assistance & Training); Government Contracting (Federal Procurement); and Advocacy (Voice for Small Business). The SBA’s Office of Veteran Business Development formulates, executes and promotes policies and programs to empower veteran small business ownership and serves as an ombudsman for Veterans to ensure all SBA programs are accessible to servicemembers, veterans, and their families. For more information visit the U.S. Small Business Administration and U.S. Small Business Administration – Vets.